Happy Thanksgiving! We are finally getting around to posting a recipe suitable for Thanksgiving- after everyone has already planned their menus. Oh well! As we’ve said before, we don’t cook for holidays in advance just so that we can blog before the holiday (mostly because we are at school all day, have homework all night, and are busy on the weekends). But anyway, we did make this tart, and it is quite elegant. The pears are poached in a mixture of honey, white wine, vanilla bean, and some water. They take on a delicate and sophisticated flavor. 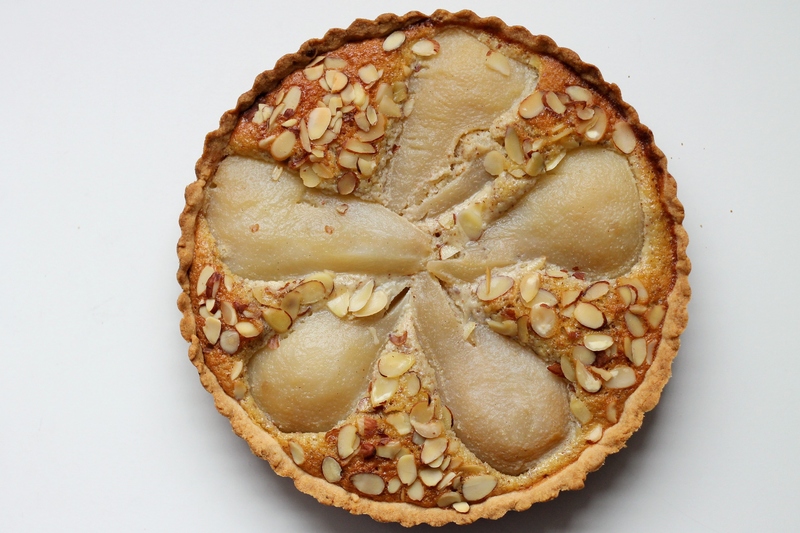 The crust has almonds in it and is quite easy to put together (and it’s a press-in-the-pan crust), and the frangipane filling (a sort of cross between cake and custard, flavored with almonds) is quite simple as well. All the components are pretty easy, and this makes for a rather unorthodox dessert to have on the Thanksgiving table that is a welcome change of pace! Bring the wine, water, honey, and vanilla-bean seeds and pod to a simmer in a large saucepan. Cook over medium-low heat for 5 minutes. Meanwhile, cut a round of parchment paper the same diameter as the saucepan. Peel the pears and halve lengthwise. Use a small spoon or melon baller to scoop out cores, seeds, and stems. Trim the fibrous strip from the center with a paring knife. Gently lower the pears into the pot. Place the parchment round directly on pears to keep them submerged (which will help prevent them from turning brown). Cook until a paring knife slides easily into pears, meeting slight resistance. This will be about 15-20 minutes. Remove from heat and let cool in liquid for 30 minutes. Transfer the pears to a large bowl and cover with cooking liquid. Cool completely (you can speed this up by putting them in the fridge). Brush either a 10-inch round tart pan or an 11×8-inch tart pan with the melted butter. Pulse the whole almonds and 1 tablespoon of sugar in the food processor until the almonds are finely ground. Add the remaining 1/2 cup butter and process until combined. Add the flour, remaining 2 tablespoons sugar, the salt, and the almond extract and pulse until combined. Press the dough evenly into the bottom and up the sides of the pan. Refrigerate or freeze until firm, about 30 minutes. Meanwhile, preheat the oven to 350 degrees. Bake crust until light golden, 20 to 25 minutes. Let cool. Spread the sliced almonds in an even layer on a rimmed baking sheet, and toast in the oven, tossing occasionally until golden, about 10 minutes. Alternately, toast them in a skillet over medium heat, stirring occasionally. In a large bowl, whisk together 1/2 cup of sugar, the salt, flour, almond flour, and baking powder. Whisk in the eggs and yolk, the butter, and the milk until well combined. Pour filling into the crust. Blot the pear halves lightly with paper towels to remove excess syrup. Arrange halves, cut side down, over filling, packing the fruit somewhat close together. Sprinkle the tops of the pears with the remaining 1 tablespoon sugar. 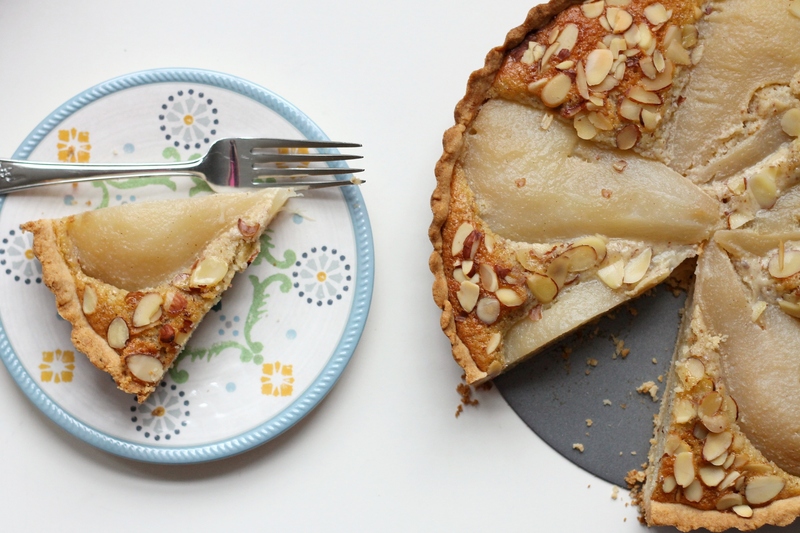 Sprinkle toasted almonds over the tart. Transfer to a rimmed baking sheet. Bake until the filling is puffed and golden brown, 60 to 70 minutes. Transfer to a wire rack to cool completely. Unmold just before serving. Enjoy! Note: you will probably have extra pear halves unless your pears are really, really small. Also, this would probably be delicious with a layer of raspberry or pear jam underneath the frangipane layer.